“Mr. 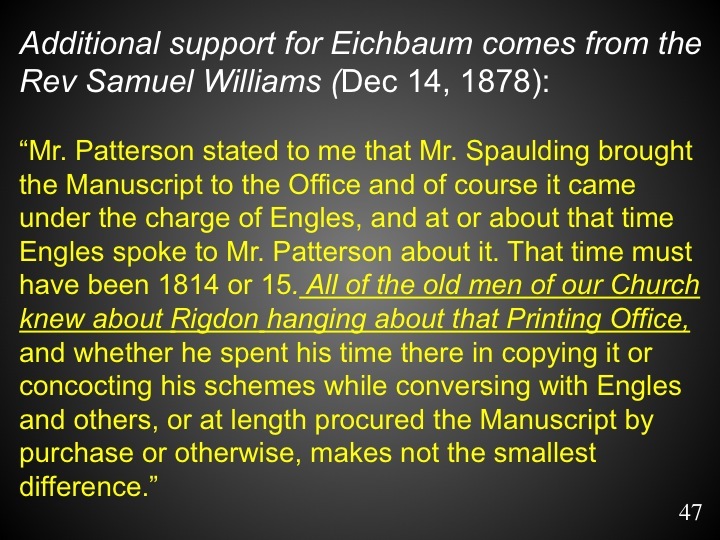 Patterson stated to me that Mr. Spaulding brought the Manuscript to the Office and of course it came under the charge of Engles, and at or about that time Engles spoke to Mr. Patterson about it. That time must have been 1814 or 15. All of the old men of our Church knew about Rigdon hanging about that Printing Office, and whether he spent his time there in copying it or concocting his schemes while conversing with Engles and others, or at length procured the Manuscript by purchase or otherwise, makes not the smallest difference. If it is true that Mrs. Spaulding had the Manuscript returned to her, then unless Mr. Spaulding had duplicate copies leaving one in the office, Rigdon must have copied it. The identification of the Mormon Bible with the Novel of Mr Spaulding I consider complete and placed beyond cavil. Now I wish to write about J. Patterson. He was Mr. Joseph Patterson who I suppose was in with his brother Robert before Lambden came into the firm. He married a very wealthy lady, built a long block of buildings on one of the principal business streets 6th producing high rents, retired from active business, and finally moved to Philadelphia to enjoy his fortune. I knew him well. I have no doubt you are right in the matter of Mrs. Spaulding’s statement concerning the interest Jos. P. had taken in the Manuscript. But Mr. Spaulding not being able to furnish the money for its publication — there it remained. I have never supposed that Rigdon ever saw Mr. Spaulding for at that time he had not as yet come on the stage, but finding such a document there shown to him by Engles in 1822 or 3. But I do not think he ever wished Patterson to publish it, thinking he might turn it to account in making a fortune. And suppose the Novel was returned to Mrs. Spaulding — it being a strange production, Engles might during his leisure hours have copied it with the intention of making something out of it and perhaps not being able to publish it, sold it to Rigdon. Any one of these Lambden, Engles, Joseph Patterson, or Rigdon might have taken a copy.